Woo hoo, it’s Monday! And it is the last Monday of the summer for us – school starts this Thursday for the girls. I have been vacillating the past two weeks between trying to get them in bed early and up early in the mornings and trying to squeeze every single moment of summertime fun from our final days. I’m hoping I’ve not done them a disservice but I figure getting up at the crack of dawn is going to be painful for all of us regardless what we do in the days leading up to the first day of school. The weekend was a busy one – Saturday was “boot camp” for Big Girl – her first foray into the world of Middle School. 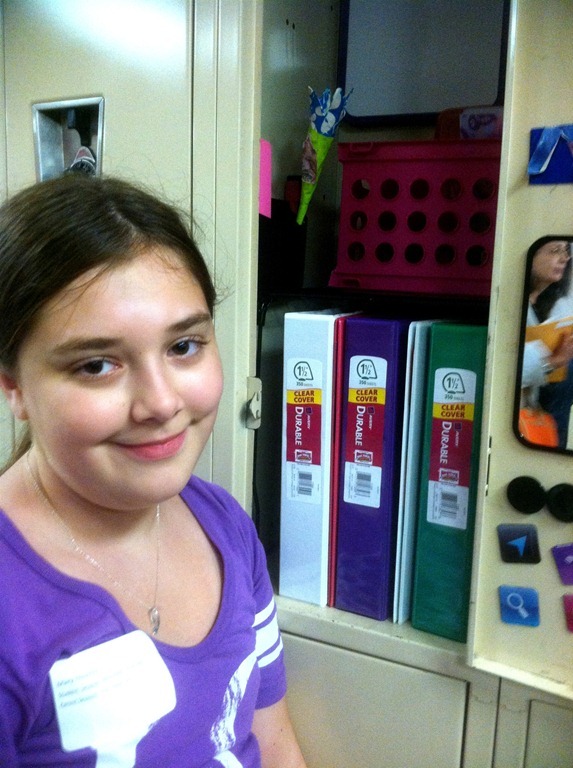 We got to meet her teachers and get her schedule – and more importantly (to her) – load up her locker! And me? Well, my biggest worry is a silly one – where the carpool lines are. The girls are both starting new schools this year, so I wonder how the new lines for school will work. I’m sure I’ll figure it all out – and since that is my only “major” worry, I think I’m doing pretty good. And with the new school year starting, I’m getting back on the menu planning bandwagon. This week we need it especially. We have afternoon appointments on Monday, Tuesday and Wednesday and then school starts Thursday. And, of course, Thursday is my busiest work day. I need to be organized and somewhat “put together” so that I can accomplish all the things I need to this week. The leftovers from the baked ham will be for sandwiches for lunch and I’m planning to make some veggie chili for lunches as well. I hope you have a great week – and that you’ll stop by again soon! Hi, first time here, hoping to read more! I can’t believe your kids are starting school already, I still have a month to go and don’t even know when I’ll be getting them ready for that! My son will be starting high school this year & I’m freaking out, LOL! HI! Thanks so much for stopping by – yes, we do start early, but they are out of school before Memorial Day, so it is a pretty fair trade, I think.